To vent or not to vent- that is the question ! Ken Bell puts the record straight on the louvres of Mk2 Jaguar bonnets. "Of all the modifications carried out at Coombs, this was probably the least popular. The louvres were long and narrow, and situated close to the stiffening rib that runs beneath the centre of the bonnet. Riveting the louvred panels into place interfered with the bonnets strength, which you couldn't help but notice whenever you opened or closed one. It also meant that whenever it rained the 'V' of the cylinder head would fill with water, soaking the plugs and H.T. leads. Louvred bonnets were NEVER fitted to race cars. Only 4 or 5 were made and - as far as I'm aware - only one original still exists. 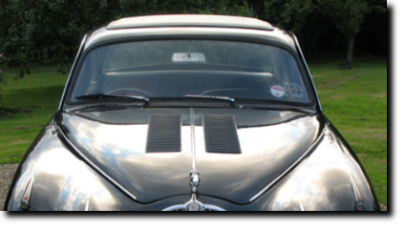 The more common E Type-style louvres fitted to cars in more recent years (like those on Grant Williams Mk1) are more practical, and probably more attractive too, but are definitely not Coombs bonnets." 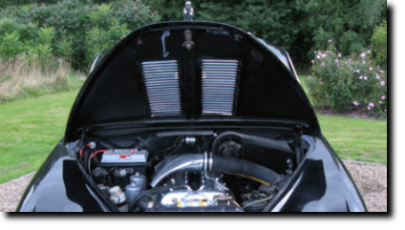 Apart from fitting bonnet vents for cosmetic reasons they are normally fitted to help reduce the heat in the engine compartment, cylinder No 1 (nearest the bulkhead) tends to run hotter than the rest. Modern modifications have been made to the bonnet vents by fitting a plate, under the newly formed vents, on the inside of the bonnet to channel the water away from the engine and air intakes. If your engine is running hot and you feel you need bonnet vents, you probably need to check your cooling system and timing first. Ken clearly points out they were not a sought after Coombs modification. On behalf of fellow enthusiasts, many thanks for your guidance Ken !